This Parmesan White Fish Recipe is one of my go to Weight Watchers Fish Recipes when I need to make a quick dinner that doesn’t require a lot of work or prep, and is still low in Points. It’s perfect for busy weeknights or lazy Sundays. And did I mention it is delicious?! Just 6 Points per serving makes this a light and tasty dish that goes great paired with a salad, soup, or roasted vegetables side dish. The Parmesan coating adds such a nice flavor to the delicate fish without being overbearing. And I love that you can use just about any kind of fish in this recipe. I have used sole, catfish, tilapia and roughey…they all turned out fantastic. So if you want to get a healthy fish dinner on the table in less than 30 minutes, try this Parmesan White Fish Recipe. It is SO easy and so savory! Enjoy. 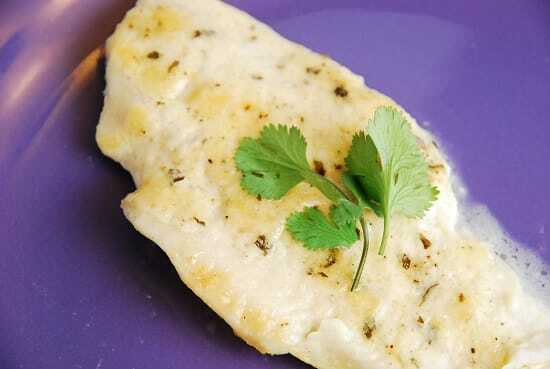 A simple yet delicious way to prepare your favorite white fish. Smothered in a buttery Parmesan sauce, the moist flaky fish makes an excellent Weight Watchers dinner recipe idea. Serve with roasted vegetables or salad for a complete meal. Lightly mist a 9” x 13” baking dish with non-fat cooking spray or an olive oil mister. Season fish filets with salt, pepper and paprika and place into baking dish, without stacking them. Brush them with lemon juice. Place in oven and bake for about 10-12 minutes or until fish starts to flake. In a small bowl, combine butter, mayonnaise, parsley, onion powder, and Parmesan together and blend well. Take fish out of oven, spread cheese mixture over top and cook until golden brown, about 5 more minutes. Serve immediately. Just made this for dinner and it was fantastic! I took Gerard advice and added a teaspoon of chopped garlic. My husband loved it! Since I retired it’s my job to scan the internet for recipes for dinner. I chose this recipe because my wife is concerned about her weight, and frankly, eating well means recipes like this. I made a few changes that enhanced it, in our opinion. First, I added minced garlic to the cheese mixture. Add one to three cloves, minced well, depending on your tastes. Second, and this may be a deal breaker as far as Weight Watcher recipes go, I blew off the light mayonnaise and made my own. We happened to be out of mayonnaise so I added that to the grocery store list. While at the store I reviewed the ingredients of light mayonnaise. I’m sorry, but every one of the brands had high fructose sugars as an ingredient. I think that type of complex sugars does more harm than fresh mayonnaise. One egg, tablespoon of vinegar, 1/4 teaspoon of ground mustard, 1/8 teaspoon of salt in a food processor. Slowly add 1 cup of canola oil and you have something ‘way better than processed sugars. This recipe for mayonnaise will last up to two weeks, and you don’t have that much. I served the fish over chopped Romaine lettuce, which I had placed in bowls and then put in the fridge for about an hour prior to serving. Once the fish came out of the oven, I flaked it before placing it on the lettuce, then I scooped some of the cheese mixture from the pan on top of the salad–yummy! The third change was to put the paprika into the cheese mixture rather than on the fish. I used a good quality paprika, that makes a BIG difference. This is now a “keeper” recipe. Good choice on making your own mayo. Reading labels is important if you are going to purchase something already prepared. Making your own is almost always a better choice. You will find a lot of garbage ingredients in fat free and “healthy” choices because they are trying to make it still taste like something good. Stay away from anything processed and eating real foods made with real ingredients is the way to stay healthy. This looks and sounds delicious! Fish has been getting me through some days when I used wayyyyy too much Points for lunch, haha . . . always glad to find new fish recipes!